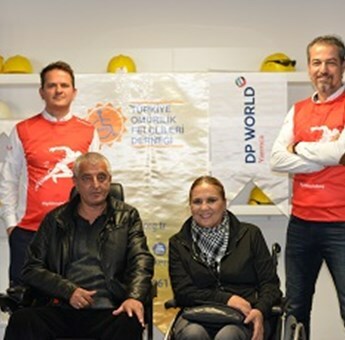 This year, DP World Yarımca, a volunteer group of volunteers from the 39th Istanbul Marathon, donated four cordless wheelchairs to needy individuals through the Turkish Spinal Cord Paralytics Association (TOFD). Today (December 1, 2017), wheelchairs were delivered to TOFD Vice President Semra Çetinkaya at a ceremony held at DP World Yarımca Port. The ceremony where DP World employees showed great interest and some employees participated in marathon t-shirts were held within the scope of Turkey Volunteering Week. Kris Adams, DP World Yarımca CEO, pointed out that December 3 is the International Day of Persons with Disabilities, emphasizing that changing social dynamics make successful companies differentiated not only by their products and services but also by the contributions they made to society. In this direction, Adams, who said stakeholders have a growing role in the company's socially responsible work and brand perceptions of the expectations of sustainable business modeling, continued as follows: "As DP World, we prefer to support projects in the areas of work safety, education, environment, women and disability within our global sustainable strategy. It transforms us beyond being a company, together with all of our employees, into a private community that chooses to 'touch' to society in which we live." At the ceremony, one of the wheelchairs was delivered to Çetin Gültekin who is from İzmit. DP World Yarımca, one of Turkey's largest container ports, serves East Marmara region. Two giant container ships can be emptied and loaded at the port where the latest technologies are used and port-specific technologies are being deployed.